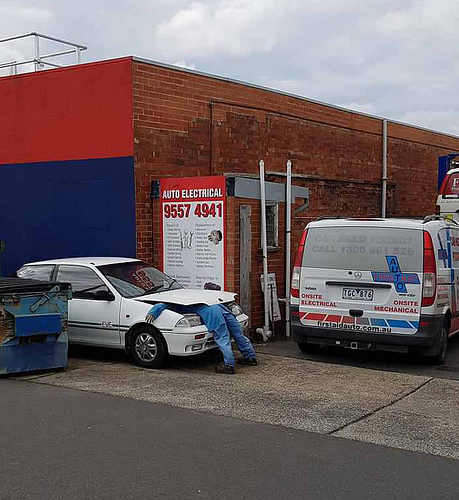 "Oh for god sake, DARREN, will you stop messing about playing Transformers and change that bloody fan belt, the customer is waiting"
Patrick was having an auto body experience. "Well there's your problem right there." "Well Mr Smith, we've done a close examination of your car and I think we've found the problem. Basically there's a dead man on your engine." Determined to win, Pete tries on his Easter bonnet. Hmmm...Lollipop men do not taste of lollipops. My last car was thirsty, but this one is just hungry. "He's been in there for three days now. I only asked him to have a quick look at the engine!" I always thought Dave was a bit of a spanner. Early in his career Lewis Hamilton wasn't the best at pit stops. Is it a Nissan Crash Guy? Sleeping on the job again. That's Dougie, he's always up to sumpin. Some men will do anything to avoid going home to their wives. Installing this dead man switch was a waste of money. He recieved a warning for being piston the job. "Be careful Bill, the engine has a fool ingestion system."